Why Bother Learning Punctuation Rules in English? If you are competing against someone else, for example with your cover letter and CV Writing when you are applying for a job. If you are on equal terms with other applicants in terms of experience and qualifications then it will be the little things that make the difference. So making sure that you have a good knowledge of punctuation rules in English can give you that edge. If you are writing a formal letter then the use of correct punctuation in English portrays a professional image that is crucial in business situations. If you are writing an academic article incorrect punctuation will decrease the credibility of your article. If you are writing a script, the reader will need to pause. The list of reasons to use correct punctuation in English goes on and on. Most importantly of all correct punctuation in English enables the writer to convey visual concepts that would otherwise be impossible. In order to give readers a clue about how to interpret a written piece we use punctuation. Comma (,) the most common mark, indicates a separation between words, phrases, and clauses. 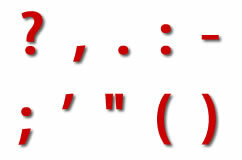 Semicolon (;) separates constructions of equal rank, not with the finality of a period but more definitely than a comma. Colon (:) is a mark of anticipation, pointing to what follows: formal quotations, series too long or too complex to be prefaced by commas, and occasionally before explanation statements. Dash (—) is a mark of separation or interruption, more emphatic than a comma, less frequently used. Hyphen (-) is used to connect one part of a word to another, or to connect several words. Brackets or Parentheses ( ) are used to enclose explanatory statements not built into the structure of a sentence. Question mark (?) after direct questions (What is the time?) but not after indirect questions – He asked me how you were. (Which is a statement rather than a question). Exclamation mark (!) is used at the end of an exclamation or a vigorously stressed sentence; often overused. Quotation marks (” “) are used to enclose speech in conversation and words or statements quoted from other sources. (Alternatively single quotation marks (‘ ‘) can be used). Apostrophe (‘) is used in contractions (words made up of two words that have been combined: isn’t, don’t, won’t etc. ); they are also used to show possession (Mike’s clothes). Slash (/) most commonly used to indicate two possible words or concepts can be used in a sentence (and/or, man/woman etc.). Asterisk (*) / Dagger (†) are used to signal further explanation in either a foot note or an endnote, often denoted as a key. Questions often arise when there is the possibility of using two or more of the array of punctuation marks available to the writer. There are no hard and fast rules about correct punctuation in English, rather just general guidelines as outlined above. The most important thing to remember is not to overuse punctuation as this will dilute it’s purpose and meaning. It is also important to remember that nobody remembers the correct use of punctuation in English all of the time, so use your common sense, read, re-read your written piece and if possible get someone else to read through it for you too. Thank you for taking the time to look through our punctuation rules in English guide. If you have any questions or suggestions please contact us.